DJ Dan Murphy, one of the chaps behind the forthcoming charity remix of Olivia Newton-John’s classic single ‘Magic’, has released a short, sharp 24 second burst of the new version over on his Soundcloud page (link below). ONJ fans will, of course, remember the track from the classic ’80s movie ‘Xanadu’. Back then, it became a top five hit here in Australia and topped the Billboard singles chart over in the US. The new edition of ‘Magic’ will be released next week, with Olivia’s premiere of the single set to take place on this week’s Dancing With The Stars. 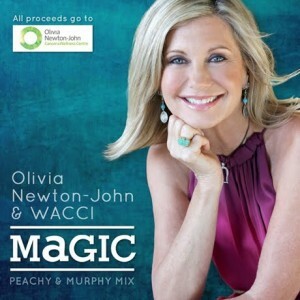 And of course, all proceeds from the sale of the single will go directly to the Olivia Newton-John Cancer and Wellness Centre. Previous Post: « GEE! IT’S GINA! She still sounds amazing! Hope this hits radio!